This article is an excerpt from Portland: A Food Biography (2014) by Heather Arndt Anderson and is used with her permission, Heather's Arndt family is from the Volga German colony of Norka. Volga Germans were accustomed to living as outsiders; they had done so for more than a century in Russia, maintaining their German ethnicity and language during the entirety of their settlement in the Volga River Valley. Volga Germans maintained their foodways as well, with few influences from their Russian neighbors. There are exceptions, however; the Volga German word for pancake, belina, comes from the Russian blini. The traditional Volga German dish bierock, a bread stuffed with cabbage, onions and ground beef resembles pierog in etymology and is typical of the Russian meat pies pirozhki. Dishes like Fleischkeukle, a fried meat pie originating in Turkey, appear to be influenced by the Tatars that also lived along the Volga. Culturally secluded Volga Germans did not eat tomatoes until they arrived in the United States, because these crops had not yet been integrated into German cuisine before they departed for Russia (like many northern Europeans, Germans were wary of the nightshade and stuck to keeping tomatoes solely as decorations until the late 18th century). Consequently, Volga German versions of some Russian dishes reflect this distinction. Volga German cabbage rolls called halupsi, for example, are based on Russian goluptsy, but whereas the Russian version is often served with tomato sauce, traditional Volga German recipes never called for tomatoes until they were Americanized. 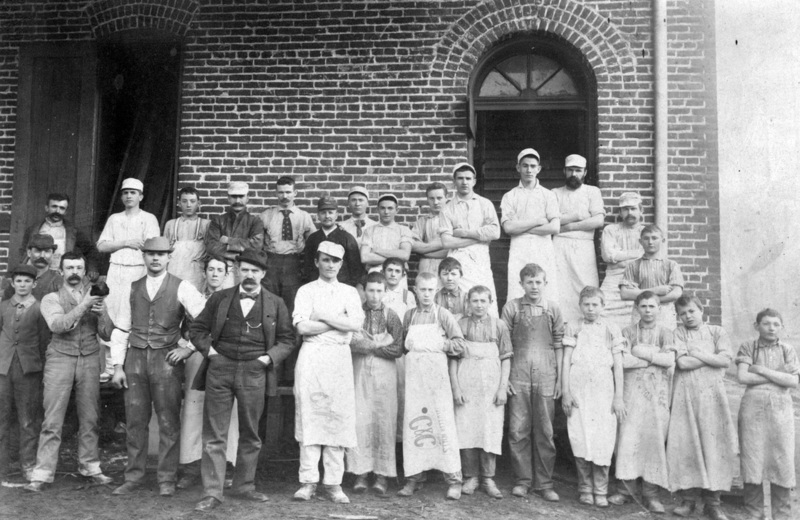 In the 1890s, the “Russian” bakery workers at the Portland Cracker Company were actually Volga Germans. Photo courtesy of the Oregon Historical Society. In the 1920s and 30s, many Volga German women and children took seasonal jobs picking berries, but more frequently they worked picking hops. Several families would travel together, 30 miles south, to the German-owned hop fields in St. Paul on what they thought of as sort of summer retreats. They packed tents and two weeks’ supplies with them: homemade roggebrod (rye bread), cured bacon and other meats, baking supplies and staples like potatoes and onions that traveled well. The women cooked meals outside where wood-stoked cook stoves were situated, sometimes under an open-air shelter filled with picnic-style tables and benches. With no ice boxes available for cold storage, we would fill heavy bottles and containers with perishables (milk, for example) then seal them tightly and sink them in the creek. A truck from the local grocery came by every afternoon when the field work was finished, providing us with a veritable market on wheels. The driver sold fresh meat, eggs, and other groceries. Picking hops was backbreaking work, often in blistering summer heat, and the vines tore up one’s hands unless they were protected by thick leather gloves. However, once the day’s quota was met, the workday was done, even if it was only the middle of the afternoon. This was when children went splashing in nearby swimming holes and women picked fruit. Some hop field owners grew berries, grapes and fruit trees along the edges of their fields or in adjacent orchards, and some allowed their hop pickers to take fruit home at the end of the trip. Some started batches of blackberry wine, others canned peaches with the canning supplies and jars they brought along. Women also filled a spare pillowcase with hops to take home for brewing the family beer. At the end of each day, pickers turned in their haul and were given a ticket to tally the weight of hops they had picked, and before heading home at the end of the trip, workers turned in their tally tickets for cash. Because of the late-summer season for hops, children often started school late, but Portland teachers were kind and lenient, understanding the importance of picking hops not only to the livelihood of Volga German families but to their culture as well. ​Over only one generation, Portland’s Wolgadeutsche became American—much faster than the Volga Germans elsewhere in the US, and despite the fact that they had remained ethnically German for nearly 150 years while in Russia. The first-generation immigrants to Portland made efforts to shed their ethnicity. They insisted their children speak English even at home; they preferred packaged, white Franz bread to the working-class brown rye of their homeland. Their sons married nice, local girls and moved out of the neighborhood (some of these local girls learned the recipes of their mothers-in-law). After World War II came the Vanport flood; as water rushed into that doomed lowland, African Americans rushed into Albina to live alongside the remaining Germans of Little Russia. Read more about the many Volga German-owned food businesses in Portland. Read Volga German Bierocks: So Much More Than Bread Filled with Hamburger Meat​ written by Heather Arndt Anderson. Read Black Nightshade and Bierocks written by Heather Arndt Anderson. 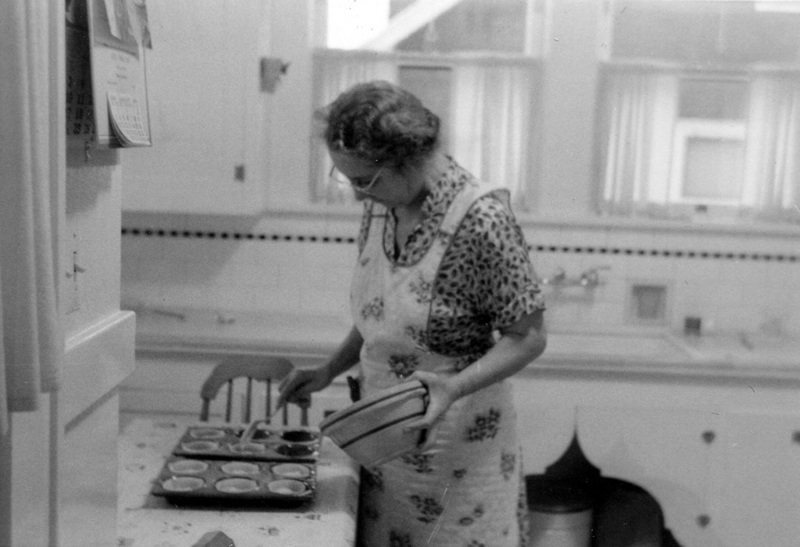 Elizabeth Schreiber (née Döring) works in her kitchen on NE 13th street. Photograph courtesy of Walter Schreiber. ​Lucile Saunders McDonald, “Letter to the Editor,” Oregon Historical Quarterly, Vol. 61, No. 1 (Mar., 1960), p. 66. McDonald, “Letter to the Editor,” p. 66.
http://www.volgagermansportland.info/recollections-of-summer-hop-picking.html. Accessed June 1, 2016.